HÀ NỘI — Ten out of 12 loss-making projects under the management of the Ministry of Industry and Trade (MoIT) have continued falling in the negative numbers, the ministry’s report said. According to the report sent by MoIT to the National Assembly (NA) delegates, after a year of implementing solutions following a request from the NA in 2016, some of the projects have shown positive results. The Quý Xa iron ore mining and quarrying project, the Lào Cai iron and steel plant, and the DAP 1 Hải Phòng fertilizer plant have all reported rising profits and falls in accumulated losses. Loans from commercial banks had decreased by VNĐ193 billion, resting at VNĐ20.8 trillion as of January 31 this year. However, the ministry said the 10 projects will face difficulties in paying principles and interest to the Việt Nam Development Bank (VDB), and other lenders. Their accumulated losses were VNĐ18.7 trillion at the end of last year, up VNĐ2.6 trillion over 2016. As of December 31, 2017, the 12 inefficient projects had a total equity of VNĐ33.41 billion, down VNĐ4 trillion over the same period in 2016, while their assets and debts were VNĐ58 trillion and VNĐ58.5 trillion, up by VNĐ366.7 billion and VNĐ3.4 trillion respectively. According to the ministry, the total initial investment of these 12 projects was some VNĐ43.7 trillion, which was later adjusted up to VNĐ63.6 trillion (an increase of 45.65 per cent). Of this, their equity was VNĐ14.4 trillion, accounting for 22.56 per cent, while loans made up 74.6 per cent, about VNĐ47.5 trillion. The remaining 2.84 per cent came from other sources. Local bank loans for the projects amounted to VNĐ41.8 trillion, including VNĐ16.9 trillion from VDB. Foreign loans guaranteed by the Government totaled VNĐ6.6 trillion and were used to fund Dung Quất Shipbuilding Industry Company Limited, Ninh Bình fertilizer plant and Phưong Nam paper pulp mill. 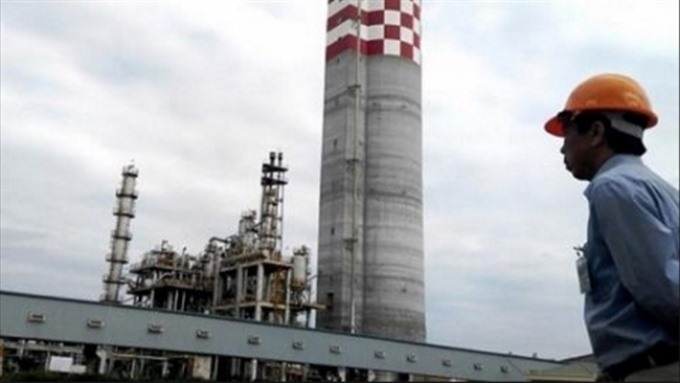 The ministry said the projects’ outstanding loans were still high, especially those borrowed by Đình Vũ polyester fiber factory, Quý Xa iron ore mining and quarrying project and the Lào Cai iron and steel plant and Hà Bắc fertilizer plant projects.